My expectations were quite low when I picked up this book.To be very frank,I didn't know what to expect out of this work.The cover was not very appealing,neither did the title.The blurb given on the jacket made me feel that I was going to read a book version of one of those Ekta Kapoor sagas which they air every other day on television. 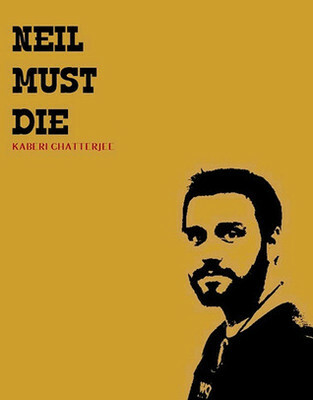 Debutant Kaberi Chatterjee's 'Neil Must Die' is the (lovelife) story of Neil,a twenty something lad from a conservative Bengali family.He falls in love with his bhabhi(Tuli) which sends shockwaves through the Roy household.Perhaps to get out of this mess,Neil escapes to Bombay and befriends Remo-the trusted aide of a dreaded Mafia don(-Hassan).But little did Neil know that circumstances would force him to work for the Mafia one day. 'NMD' is also the tragic tale of Tuli,the eighteen year old girl who is married to the wrong guy.The other characters in the story are Juhi,the high-end call girl who develops an instant liking for Neil,Soumen-Neil's brother and Tuli's 'lawfully wedded husband',Mahamaya,Vikram Bhatt and Cathy-Neil's foreigner friend who almost convinces him to start his life afresh in Stockholm. Coming to the positives of the book,author has tried to tell a bold tale in a neat manner without resorting to much gimmicks or word play.The book uses it's 'Bengali connection' quite well,I must say.Kaberi plays tribute to the beautiful city of Kolkatta without relying much on the in-your-face cultural stereotypes to prove her point.The book is decently edited and also modestly priced. On the downside,the basic problem with this book is poor characterisation.Barring the title character(that too only to an extent),none of the characters are well etched out which is a pity since this is one work which relies heaviy on it's characters to strike a chord with the readers.The reader never gets to know the real 'Tuli' and most of the time we get the feeling that she is one of those hyper-active adolescent girl who takes impulsive decisions.Kaberi might have a good command over the language but what is the point if the reader is not able to empathise or relate to the characters which she had written?Likewise,Neil is one guy who is loved by each and every other girl whom he meets in his life.Be it Juhi,Tuli or even Cathy,every XY is ready to share bed with him and he quite seems to be "living the dream",then why on earth should he die?Honestly speaking,not even once did I feel like sympathising with him.I wish the author had spent more pages trying to emphasise the intensity of the bonding or love between Tuli and Neil rather than filling page after page with Neil's sexual escapades with the different women in his life!The parallel track involving Hassan bhai,Vikram Bhatt and Remo evoked a sense of dejavu and the twists and turns seemed rather predictable. Verdict- I am giving a 2.5/5 for this work.